When I was younger, the words street art and graffiti did not exist in my vocabulary, only vandalism did. I always wondered how the nameless, faceless entities were able to get their pieces onto hard-to-reach surfaces, only to disappear anyway after a few days, hastily whitewashed away with uneven paint. It was a constant battle between Manila taggers and the local government’s interest in “beautifying” city. At any rate, in my juvenile mind, I thought that expending resources and energy on top of risking police trouble for such a transitory piece was, well, futile. When we moved to Scarborough, one of my earliest memories of taking public transit was looking out the window and seeing the huge masterpiece as the westbound RT pulled into Lawrence East station. Just like in the movies, my newcomer-prepubescent mind thought. I wondered idly how long it would take the authorities to paint over it and how quickly new graffiti would cover it up again. To this day, the piece stays (based on what I learned from this workshop, it’s most likely a mural). Last year, I went to the Jean-Michel Basquiat exhibition at the AGO. There, I learned a bit about the relationship of social tension and race relations to street art, the inherent performativity of illicit art creation, and the physicality of jumping fences while carrying spray paint cans and having to run away quickly if cops come. I was intrigued by the political underpinnings, but I also figured that perhaps I am simply fated to appreciate, not necessarily understand, the esoteric world of graffiti. Last Saturday, local Toronto artist Carol Ann Apilado led Clutch vol. 8 on a journey through Kensington market’s very own art-filled alleys. 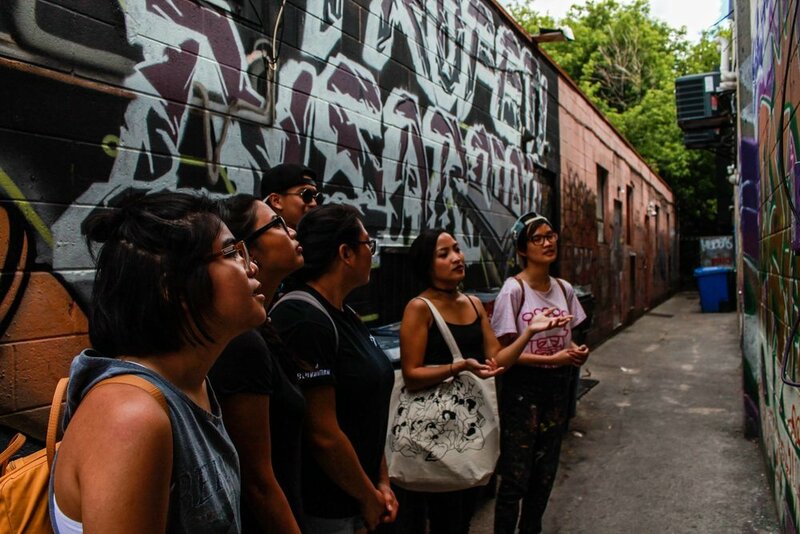 As a Filipina artist, she is not only carving a space for herself in the professional world as a designer but also as a striking presence in Toronto’s graffiti community. It had not previously occurred to me that there are female graffiti artists around; my assumption was that since graffiti art is largely created at night, it would be dangerous for women to participate. Well, sometimes it’s not such a bad thing to be proven wrong. Tags, throwies, bubbles, characters, masterpieces. Those were some of the new words that I learned during our educational graffiti walk with Carol Ann. She showed us some of the Toronto street art mainstays and introduced us to other female graffiti artists. It was an empowering experience to learn that there are female graffiti artists who are leaving their marks all over the city and defying the male dominance in the art form. Carol Ann shared with us that being involved in street art has given her more confidence in walking around the city at night; another way graffiti has empowered her to claim space. Part of the graffiti culture, from its roots in 70s New York has been style wars and dissing. Kare also shed light on how it can be quite difficult to be a female graffiti artist: pieces get dissed for being soft, characters get tagged on, pieces are defiled. Even so, it just goes to show how womxn are establishing their presence in the graffiti community, enough to get the attention of other writers. After our graffiti walk came the time for Clutch vol. 8 to try out creating on our own! We are grateful for Toronto Collective’s generosity in providing us with the paint that we needed to create a sign for our upcoming TAYO exhibit. We were inspired by the art and stories we encountered and excited to fill the canvas with the colours we painstakingly negotiated. Starting to paint was an entirely different story! Holding a spray paint can was intimidating and letting that first bit of paint out even more so, but Carol Ann was gracious in reminding us that mistakes are not indelible; there is always a chance to make amends. We drew several groups of audiences during the time we worked on the sign, and at the end of it all, even made a new friend who kept telling us to put on our face masks, in the name of safety. Ultimately, I am thankful that our time with Carol Ann opened up new perspectives and presented a new understanding about the world of graffiti. Apart from teaching us about the aesthetics and social implications of street art in Toronto, Carol Ann also embodied for us through her very own work that graffiti is a tool for challenging anonymity and claiming space in a world that seeks to silence the disenfranchised.